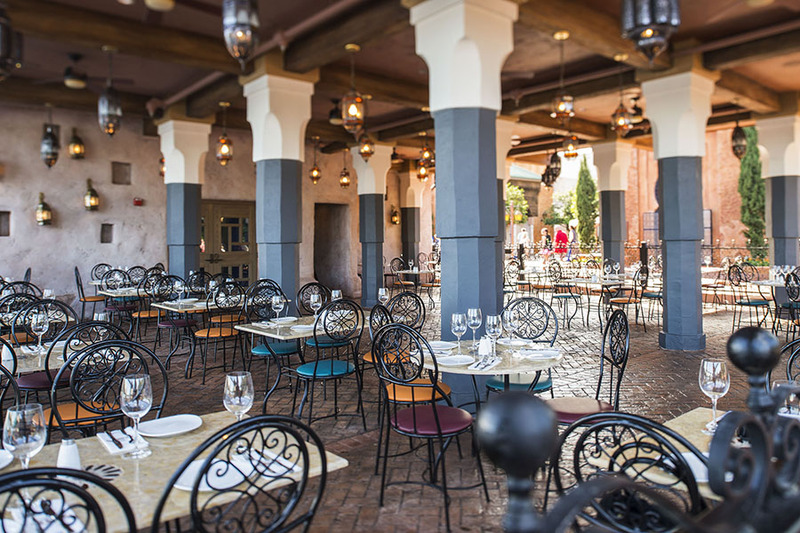 If you’re looking for a great snack while in World Showcase at Epcot be sure to stop by Spice Road Table, Morocco’s newest restaurant. 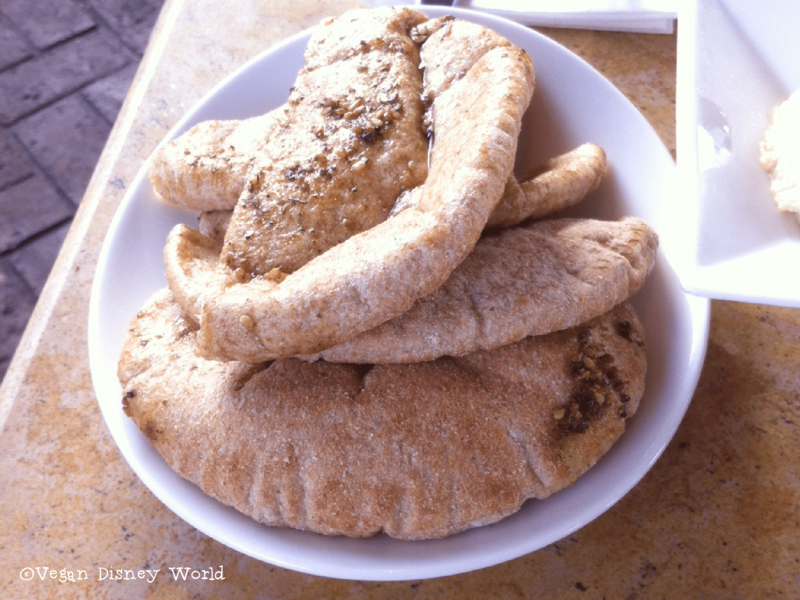 Spice Road Table offers small plates instead of the other options in Morocco with full meals. This is a great spot to grab a snack and enjoy a drink. This would also be an amazing spot to catch Illuminations without fighting a crowd to see the water. There is both an inside and outside terrace to be seated. When you walk in you can either just go straight to the bar for a drink or can ask to be seated by the Cast Members at the podium. When we went in May of 2014 we were seated on the terrace side which was beautiful, we had a great view of World Showcase. It had been miserably hot that day and the sun was just starting to hide behind the France pavilion which helped to cool us down. This is definitely a good spot for a mid day snack and break from the sun. When we looked at the menu before going we saw there was a Hummus and Imported Olives dish which we were planning on getting. When we were there we were pleasantly surprised to see that there is another option, Rice Stuffed Grape Leaves, so we ordered both. Each of these dishes are vegan as is. The dishes are a bit pricey for a small dish/appetizer size plate, $10 for hummus and $8 for grape leaves. When the grape leaves came out I was a little upset about there only being four tiny pieces. However my tastebuds were very happy to find that these little guys were packed with flavor. 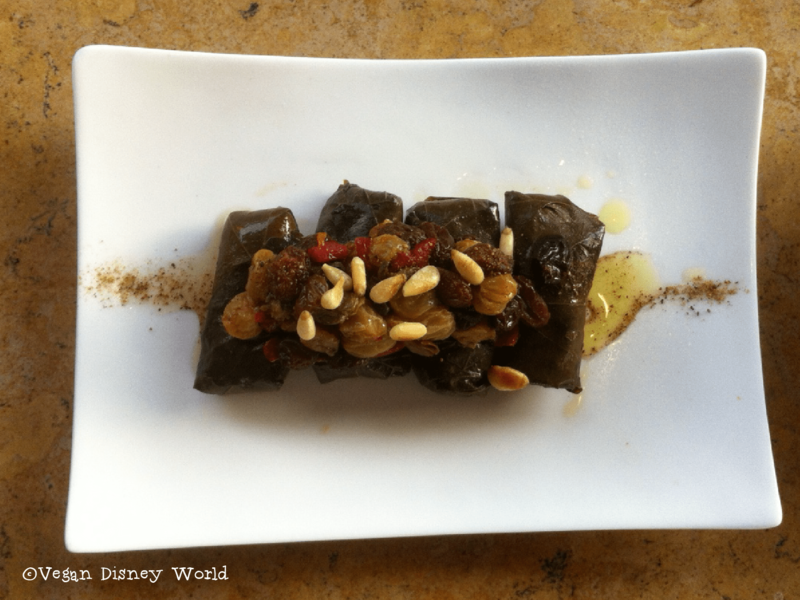 The grape leaves are stuffed with rice and fried capers, you can definitely taste the saltiness of the capers too. I wasn’t very impressed with the raisins and nuts on top of them, but I also just don’t care for raisins. My one complaint about these is that there should be more. I understand that this is a small dish restaurant but I can get a full meal somewhere for the $8 I spent on these. With that being said, I would order these again but refuse to share them. 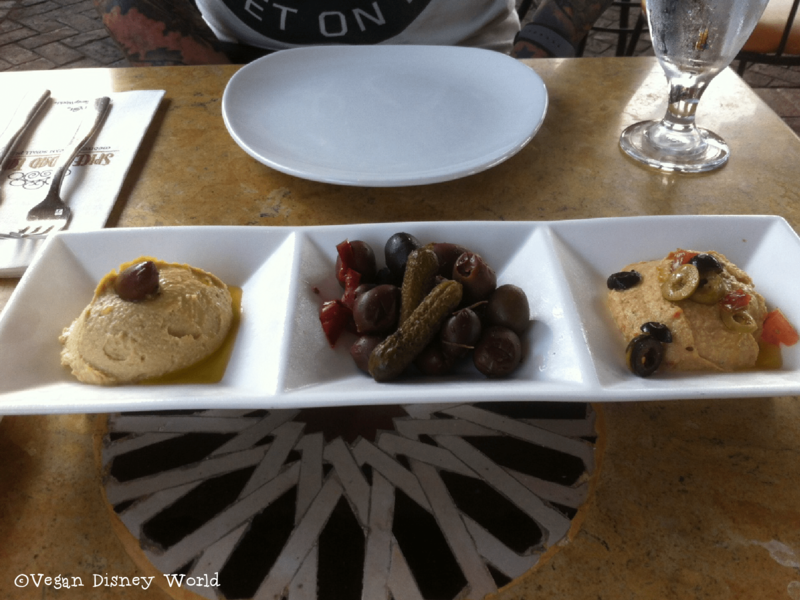 The hummus dish was delicious, it came with both a tomato hummus and a regular hummus. There was a larger selection of olives then I had expected, I often feel like restaurants skimp on the amount of olives they serve. I preferred the regular hummus over the tomato hummus, however both were the perfect amount of creamy and extremely flavorful. The bread was light and topped with oil and spices. It was a nice compliment to the hummus. We found out after we had devoured our four pieces of bread that you can ask for more bread, we did find that dipping olives in hummus was a nice substitute though. We ended up ordering another dish of hummus because we didn’t feel that we had eaten enough to tie us over until our dinner reservation. Our service at first was very good, but by the time we wanted to order another dish our server was no where to be found. When he finally came back he was very quick to bring us our new plate. This restaurant seems like it is meant to be more of a long term hangout spot for people. We noticed many of the same people who were there when we arrived were still enjoying their wine and snacks when we left. Spice Road Table offers a large wine selection as well as other alcoholic beverages. I would enjoy spending more time here in the evening and catching Illuminations. Would we go back? Yes! The food was delicious, but I would go in knowing that it’s an expensive snack. Just found your blog and have been reading through some of your reviews. I was looking at going here, but was hesitant as the menu didnt seem very vegan friendly. The prices are still something to think about, but its nice to know there are some options if my group wants to give it a try. The food was really good here, I would suggest stopping in if you have a late dinner. It was a great place to relax and munch on food. The price is a little high for my Disney snack preference but it was a comfortable place to sit and enjoy some food. Hope you try it when you go!